The Cricket Debate podcast: Bob Willis and James Taylor on England’s Lord’s thrashing Last Updated: 27/05/18 8:59pm Bob Willis and James Taylor debate England’s hammering at Lord’s “It is getting worse and worse. 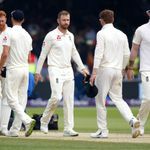 The words of Bob Willis on the Cricket Debate after England’s nine-wicket thrashing at the hands of Pakistan at Lord’s, a seventh defeat in 10 Test matches for Joe Root’s side. Trevor Bayliss speaks to Ian Ward about what went wrong for England in the first Test against Pakistan at Lord’s.